Yesterday was an amazing day. NPR’s Morning Edition ran the canning story at the end of the second hour. I sat in my kitchen, nervous as I’ve ever been, waiting to hear it. I loved it. Linda Wertheimer took four hours of cooking and chatting and pulled together a cohesive, charming tale of canning. And I think it did a lot to dispel the notion that canning is onerous. I’ll admit that hearing my own voice on the radio was a bit of a shock. When did I start sounding so much like my mother? Or my brother? But when I got over all the self-critical stuff, I was really happy. I knew traffic would be up here on the blog, but never in a million years did I expect to be so overwhelmed so instantly. Every time I checked email, there were 75-100 new messages. And comments here. And on Facebook. And phone messages. Really amazing. I love you all. Thank you for sharing the day with me. And thank you, Linda Wertheimer, Sasa Woodruff (the brilliant, wonderful producer I worked with) and Leah Scarpelli (the production assistant who recorded all the pings and plops and other sounds of the canning kitchen.) Everyone was so wonderful. All professional, smart, and interested – just as you might imagine from NPR. 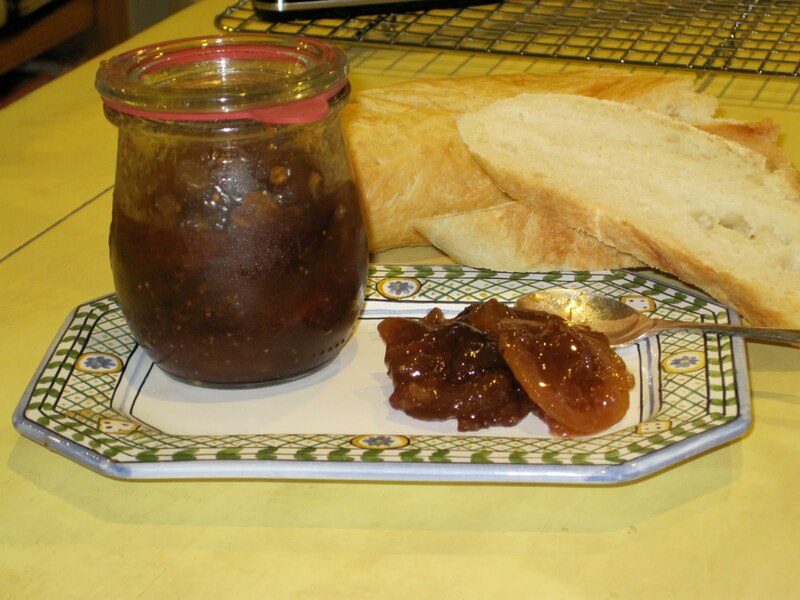 There’s only one more recipe from the Morning Edition show to share with you, and that’s the French-style fig jam we made. This is a very sophisticated preserves, more confitures than jam. The thin slices of lemon are bitter in the same way marmalade has a sweet and sharp taste, and the figgy goodness and honey laced syrup balance beautifully. It’s exquisite with cheese – anything from a soft fromage blanc to the more developed aged cheeses – my personal favorite is the Grayson Reserve produced by Meadow Creek Dairy (I find it at Stoneyman Gourmet Farmer, Bethesda Central Farm Mkt.) A sinful lunch? Grilled cheese sandwiches with fontina and this jam. I’ve employed the maceration technique I learned from Christine Ferber in order to infuse the syrup with the thyme and give the lemons some time to soften. You can skip this step, but I hope you won’t. Pour boiling water over the figs, allow to stand for 10 minutes and then drain. Quarter the figs, then place them in a large preserving or other non-reactive pan. Wash the lemons well and slice very thin with a mandoline or a sharp knife. Remove the seeds. 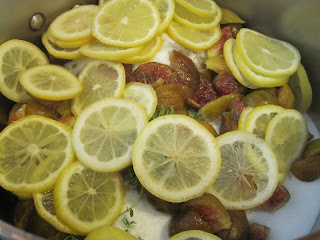 Add the lemons, honey, sugar and thyme to the figs. Bring the jam to a simmer, stirring to dissolve the sugar. Pour into a ceramic or glass bowl, cover with parchment and refrigerate overnight to develop the flavors. The next day, put the jam back into the preserving pan and bring up to a full rolling boil. Boil hard for five minutes. Remove the thyme. I like this as a loose jam, but if you want it to be firmer, just add one packet of liquid pectin at this point and follow package directions. Pour hot jam into hot sterilized jars and process for 10 minutes in a boiling water bath. Have a wonderful Labor Day weekend. Around here, we’ll be working on getting the house put together. I’m very close to showing you all what it looks like – we’re just waiting for three more pieces of furniture to arrive and I want to get some art back up on the walls before the grand unveiling. I am so glad you posted the recipe…I am making this delectable sounding jam just as soon as I can find some figs. The piece on NPR was fantastic- I hope it brings tons of traffic to your blog as well as lots of other good things, Cathy. I found your blog after hearing the lovely NPR story. 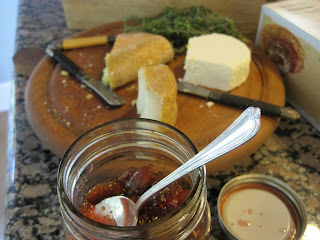 I want to make these fig preserves and the green tomato pickles immediately! Hi Lara – Really glad you enjoyed the NPR piece. Let me know how you like the preserves & pickles. It's friday and in just a few hours I will have a martini with a tomolive to toast this wonderful week. Danielle, yes! make the preserves! figs are ripening now, and it's a long weekend. Get Georgie to help! 🙂 Have a great weekend. Lisa, How nice to hear from another canner. I've been thinking about making mustard – bought some amazing (inventive!) ones at a farmer's market earlier this summer and have been tasting and thinking about it for months. If you make the fig confitures, I'll make the mustard! Cheers, and thanks for stopping by. Congratulations on such a wonderful opportunity to share your talents and knowledge! (&the anniversary camera :") ) Anyway, I love figs and I've never canned before so this may just be the nudge I need. I grew up eating jams, jellies, preserves canned by a great aunt/uncle so I "know" the marvelous difference. Its nice to read "how easy" the process must be. Now to buy the toys, right? Thanks again. Fabulous! Would you pretty please post this to Punk Domestics? Good stuff! Here I am, straight from the NPR website! 😀 As luck would have it, we had already planned a tomato canning session this weekend, but now I'll have to see if the farmers have any figs left at the market tomorrow! Congratulations on getting your message to the masses. I'm going to be posting a link to your blog from mine, as I think several of my followers would enjoy your recipes. I listened to the show on NPR two days ago (or so) and loved it. Looked up your site and WOW. Great work. You remind me of my Mom who fears nothing in the kitchen or her garden. Thanks and keep on cooking! Sean – Done! I love punkdomestics.com What a fun fun site. Thank you! Flartus, thanks so much for posting a link. I really appreciate it! Your blog is darling. So nice to see this canning community! Congratulations on your NPR piece, Cathy! This recipe sounds absolutely delicious – thank you! I was hoping for the fig recipe too! What a week you have had – congratulations! Thanks so much, Lynda & Liz. Isn't it wonderful that through Food52, Twitter and our blogs, we've gotten to know eachother? I thank my lucky stars every day for my *invisible* friends. You were the bright spot of an otherwise "about to be dreary day"! Thank you for your wit and charm on NPR. You have re-invented me and my canning/preserving ways. I am rushing to gather the supplies for the long weekend in the garden and the kitchen. Any thoughts about canning cherries to finish off the perfect Manhattan? Michael, Check out the post from July 9th – I canned cherries in chipotle syrup. I've been marinating a few of those chipotle cherries in Maraschino Liqueur to make smoky hot cherries for Old Fashioneds. If you don't want smoky, just leave out the chipotle. Hi Helen, I've been giving the tomolives away to folks on my holiday list. Actually, to just about everyone. I have a lot. They'll keep about a month, maybe longer, but must stay in the fridge. I tried processing them and they lost integrity completely. (blech) And evidently, the USDA doesn't recommend canning cherry tomatoes. I am also glad you posted this recipe. Of course, I'm one of the many, many people that heard you on NPR and this is the first chance I've had to follow up by checking out the blog. 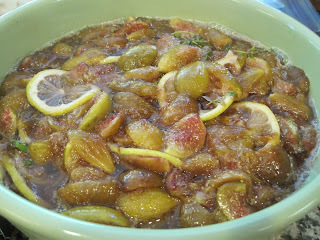 The fig recipe was one I particularly wanted to see, as the very first things I ever canned were fig preserves. I truly enjoyed the NPR spot and am so glad you are shining a light on the art of canning. This sounds delicious. I am going to make this to serve when my grandaughters comes to visit next month. Thank you very much for sharing this with me. Yet another person to have found your wonderful blog through the story on NPR. It happened to come at a particularly good time as I am about to go on a two week vacation and want to preserve as much of my harvest as possible since it wont be good when I return. I haven't had the chance to fully peruse your blog yet but I wonder if you have any advice about what to do to preserve leafy greens. I have tons of kale and have just been steaming and freezing it in freezer bags, but I'm wondering if you have any recipes or experience with this? Keep the amazing recipes coming! Hi Mrs. Wheelbarrow. I'm one of those NPR listeners who just popped over — although I'm a little slow to the party (I'm so glad for the NPR website — it fills in a hollow left when my family moved to England). Thanks for sharing your knowledge & yummies with the world. Hi Cathy, and congrats on the piece! I read it online – haven't heard it but I'll bet you were great. I’m a canning newbie, although my mom canned everything – tackling tomatoes this wknd so I'll sure to see how you do it. I'll also be linking your blog to my food blog – yours is wonderful, and full of great advice and recipes. Heard you on NPR on my way to work. The first thing I did when I got there was turn my computer on and go to your site! I am so excited to try the pickled green tomatoes, as I live in Alaska and any day now we will have our first frost. I don't want to lose any of my homegrown produce that I worked so hard to keep alive and well! Welcome to all you NPR listeners. It's amazing to see all these nice comments. PS. I've never preserved leafy greens other than blanching and freezing, or as a ravioli or manicotti filling! I was on my way to school when I heard the NPR story–and nearly cut class to go to the farmer's market! I grew up with home-canned yummies, but life got in the way, and I didn't get the chance until now, when I'm supposedly "retired", to re-start the tradition. THANK you for sharing a few of your recipes to get me started! Thank for sharing this recipe! I was looking for it! And great work on the NPR piece. So impressive, and you deserve every bit of the limelight! Enjoy! I haven't been on the computer much lately (canning all our fruit crop!) so my husband sends me links to things he thinks will interest me. When I followed the link to the NPR story about canning, I yelled to him, "Hey! I know her! Remember when I showed you pictures of her house covered in snow last winter?" What a happy thrill it was to see the story and hear your voice! I just moved into a cute bungalow in South Pasadena CA and when i heard your piece on NPR i was like omg i should totally do that. I am so excited that you share your ideas and recipes with the world :). I am sure i will have questions for you as this will be my first time doing this. I really want to decorate with some beautiful canned veg and preserves. Congratulations on a great week. You inspired me to try the fig confiture recipe. I have a bowlful of wonderful smelling jam waiting to cool down enough to refrigerate. However I think the jam is too liquidy. I quartered before soaking in boiling water. Do you think I could simmer the jam to reduce it down before doing the hard boil step? Thanks again for the wonderful recipes and for bringing back memories of canning with all my aunts! Denise, Yes, you should cook the jam down to reach the consistency you want. It won't change once you get it in the jar. Congratulations on you NPR story, Cathy! Excellent piece. It's always pleasant to see you on Saturday morning at the farmers'. I like your passion and enthusiasm for good food. Very nice photo of the deliciously preserved goodies on NP R's website-simple Mason jars packed with absolute "goodness"
I have very much enjoyed your contributions to food52 and I wanted to let you know that I am eating your jam right now; we made it this weekend as the first foray into jam-making. It is so delicious that toast is superfluous – all you need is a spoon. I am already worried that we only have seven more jars. Thank you! Congratulations on the NPR article! I'm just getting into canning this year and can't wait to give your peach salsa recipe a try. Thanks for the wonderful jam recipe. I bought a pound of figs at Whole Foods over the weekend and made a small batch of 3 jars. We had our neighbors over for dinner on Monday night, and started with an appetizer of homemade whole wheat bread (cut into small squares) topped with goat cheese and a smear of your fig, lemon and thyme compote. It was delicious! Hello! My very first canning experience is your fig-lemon-thyme recipe! I was SO happy and excited and it turned out great! Then I started reading about botulism. Now – my happiness has been replaced with worry. Can you reassure me? I want to happily can! I found your blog and just happened to be trying some canning recipes for strawberry, peach and apricot preserves. I have a beautiful mission fig tree with a ton of ripe fruit, fresh lemons from my yard and more thyme then I know what to do with. How can I not make this fantastic recipe? My preserves came out great and I can't wait to try this new one. I enjoyed your interview on NPR. We heard your NPR story and when you stated you threw the guts of the tomato down the drain we knew you weren't in it for the canning. If you are looking for local, organic figs head to Ticonderoga Farms in Chantilly, VA. http://www.ticonderoga.com/ Email them and tell them how many pounds you want. I made fig jam several weeks ago and went back today and picked up another 10 lbs of Brown Turkey figs. Amazing quality! I just made your jam/conf in Toulouse, France , with figs I foraged from the countryside, a lemon from my husbands parents and some thyme which grows wildly in their driveway. I've just covered it and I'm anxiously awaiting tasting it tomorrow. Thanks for such a great recipe. I just finished the first stage of this recipe ( took me a long time to find it again last night, couldn’t remember where I “read” it). I am making a small batch to test it out as i am a novice. I noted my lemons have a much larger skin (less actual lemon) than in your picture. Is it a good idea to cut the lemon in quarters, they seem like big hunks? I would really appreciate a reply as I will be finishing and canning soon. Hi Debbie – I used thin skinned lemons, that’s true, so use your best judgement and cut them in quarters if they seem too large. Best of luck! Thanks Mrs. W! I’m also a new fan that found you via the NPR story. I love love love figs and just tried this recipe (affordable figs can be hard to come by in upstate NY). It turned out so yummy! Can’t wait to eat a crumpet w/ the confit when I get home today!! I’m looking forward to trying your other recipes!! Thanks again! Without pectin, this confitures will be loose, but it’s never bothered me. That’s why I call this a confitures instead of a jam. It’s fruit floating in syrup. 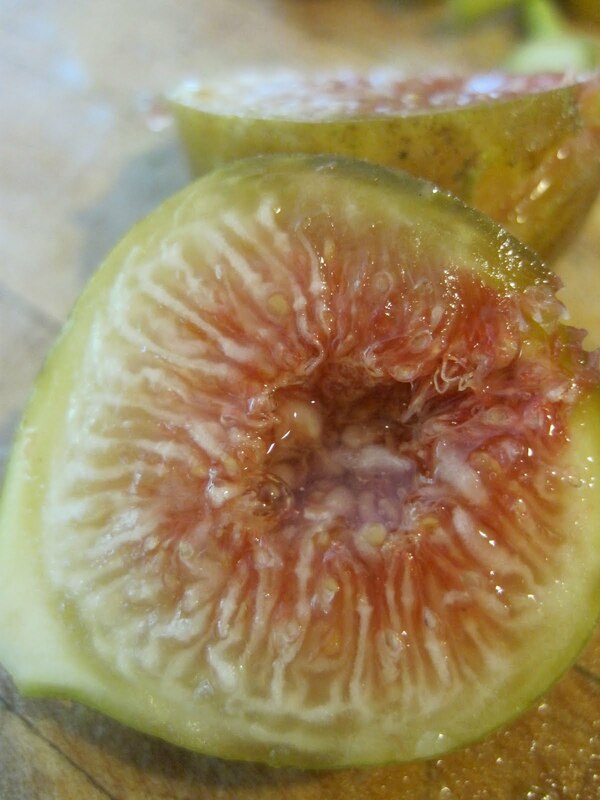 I hope you tasted your figs and will agree that it’s just delicious. The air bubbles will not create a safety issue, but to avoid them in the future, press out airbubbles with a butter knife run around the inside edge of the jar. I’m sure people are going to love their little jars of figs! My husband gave this to me for Mother’s Day this year. It’s a wodrenful collection of two discs full of stories and anecdotes, and they are all different enough from each other that listening does not get old. There were some segments I actually listened to twice. My favorite was probably Mother’s Day vs. Fishing Seaon Opener. Maybe that’s because I live in Minnesota, but I’m sure it has universal appeal. The segment Mementos Honor Sons Lost to War brought tears to my eyes, as did the story about the grandma with Alzheimer’s. There may have been a few segments that were not true driveway moments for me, but every single one of them was worth a listen. And a few of them have left pretty deep imprints in my mind. I recommend this collection! 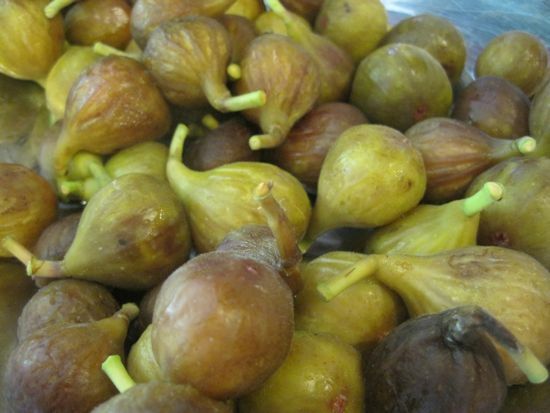 Adriatic Figs – a neighbor gave me a basketful. will they work with this recipe? thanks! HELP please. 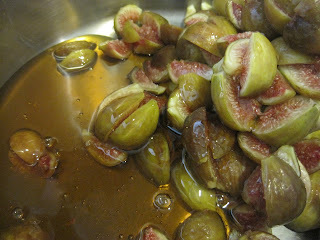 figs macerating as of last night but mix tastes too lemony; not sweet enough. I used a 1mm cuisinart disk and they very thin, too thin. anything I can do to sweeten it a bit o is it supposed to be, well, a little bitter? also is it ok to leave in frig an extra day? btw I will probably pick up some pectin. WF carries organic pectin. Since I only eat organic apples, I couldn’t see putting anything but organic in this.